Product #21830 | SKU NE8FDY-C6 | 0.0 (no ratings yet) Thanks for your rating! 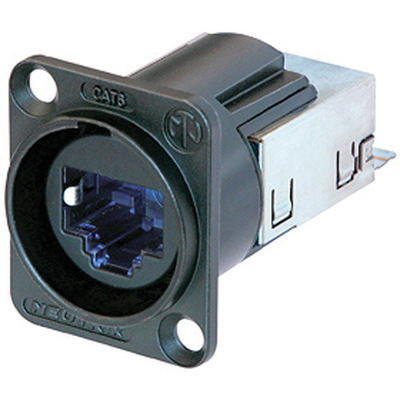 The etherCON D-Shape Cat 6 Panel Connector with Nickel Housing from Neutrik is a RJ45 connector for fast data transmission and high bandwidth applications. It offers additional support for Fast Ethernet 100BaseT and Gigabit Ethernet 1000BaseT connectivity in audio, lighting, live stage and industrial environments and it is also prepared for future 10 Gbit applications. The connector's secure latching system offers gas-tight IDC termination without using a tool, which makes the cable assembly easy and fast. It has integrated sealing rings that offer high noise immunity and EMI protection. It also makes the system dust-proof and water-proof according to the IP65 rating.